The idea of the L.E.T. 's Center began around a kitchen table out of frustration at a lack of a place for people to go and experience, practice, and do art! The type of art did not matter, but the mission was set. Find people who love all types of art and get them in the same room to start talking. Over the past year, Debbie Sanderfield Farrow and Lorraine Williams have done just that. Starting the discussion with meetings and research trips, these two ladies have been to many art centers all over Iowa and Illinois. In May 2014 it was official, the Articles of Incorporation were filed and our small but mighty Board of Directors began to plan and dream big! We've been fortunate to connect with local's who love art and love to teach art starting with our Painting Class series with Studio Artistica. We also have held seminars on the healing arts including toe reading, passion tests, and reiki sessions. Our mission is to provide a place within Washington where all arts can thrive! We plan on doing this through Learning new things, Embracing all people, and Transforming ourselves and our community. So where did we get the name? After much debate we settled on the acronym L.E.T. 's meaning Learn, Embrace, Transform. We liked the action conveyed by L.E.T. 's and you will often see it in our marketing in things like LETs Paint!, LETs make Music!, L.E.T.s do the passion test!, etc. 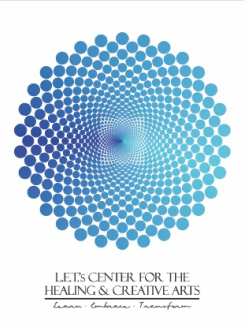 ​Let's Center for the Healing and Creative Arts is a 501(c)(3) public charity and donations are tax deductible.